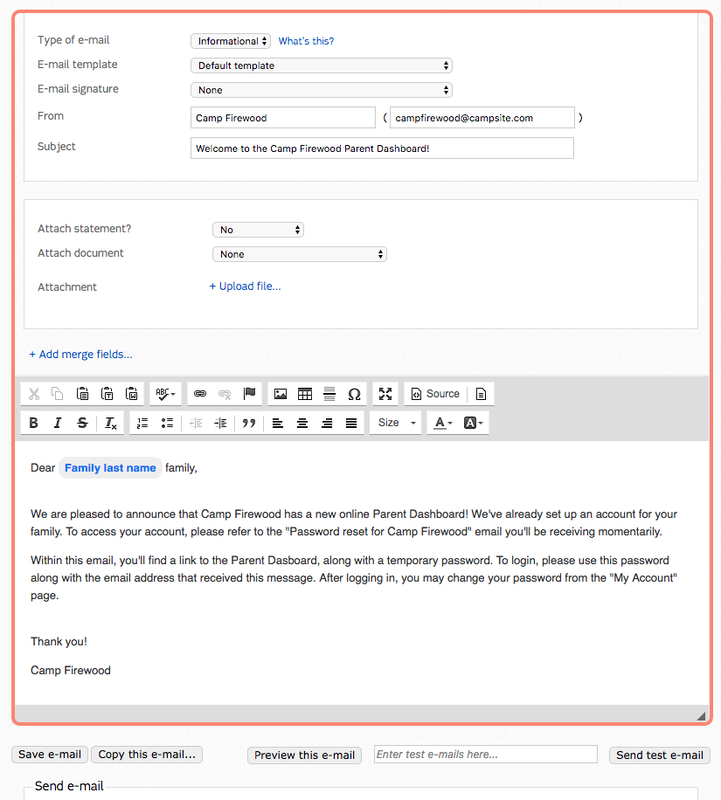 You can assign and email temporary passwords to multiple parents at once via the Advanced Reports tool. To begin, navigate to the Campers dropdown menu on the navigation bar and access the Advanced Reports page. Create a report that contains all the campers whose parents you wish to provide with a Parent Dashboard password. Next, click the "E-mail" button in the Advanced Reports toolbar to mass e-mail these parents. Select the option to send an e-mail to these families. Next, compose your e-mail message. In terms of the messaging to convey, note that parents will receive their passwords in a separate e-mail that CampSite will send them automatically, immediately after you send the current e-mail. Here's an example message that your current e-mail could contain. Next, in the "Send e-mail" section, click to "Reset Parent Dashboard passwords..."
Next, select which parents in each family you would like to reset Parent Dashboard passwords for (primary and/or divorced parents), and then click "Send e-mail." Once you click "Send e-mail," parents will receive 2 e-mails - the current message you just drafted, and then a second e-mail with their Parent Dashboard account credentials.